As a resident of Boston making her third trip ever to big, scary New York City, mostly centered around a Sonic Youth concert on Friday (which, by the way, was followed by a Dillon Francis concert within walking distance–what is the deal with this city?! 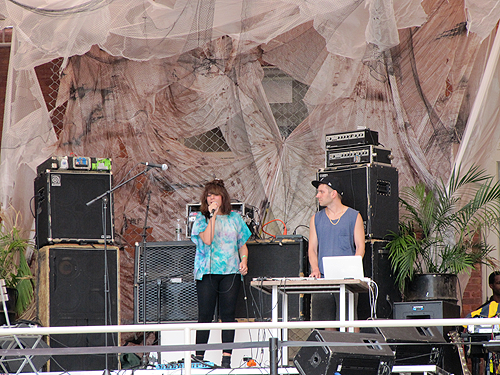 ); I was pretty elated during the trip planning process to discover that MoMA PS1 in Long Island City was playing host to a daytime show with an absolutely ridiculous lineup on Saturday, featuring Black Dice, His Name Is Alive, oOoOO, Clams Casino, Ayshay, and Water Borders. I was unable to stay for the entire event, but luckily, I caught two of my three favorites from the lineup (oOoOO and Clams Casino, unfortunately Black Dice played too late). 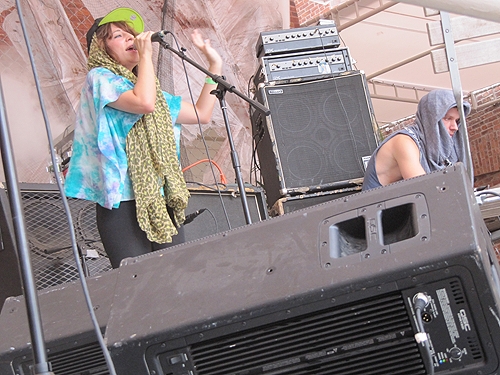 oOoOO, from San Francisco and primarily a solo artist, played as a duo, bringing in a female vocalist. His music is best categorized as witch house, a genre that is easy to mess up but pretty delightful when it's done right (and oOoOO, pronounced "oh", does it right). I knew from the moment I heard the sound check that the set was going to be something special, with the visual aspects of the performance (from the performers' outfits to the witchy decor) complementing oOoOO's music perfectly. To be honest, I was unfamiliar with many of the songs played; while I've heard oOoOO's two EPs, oOoOO and NoSummr4U, as well as a few features on compilations and mixes, I didn't recognize that much of the set (perhaps someone else can enlighten me further), but I don't think it mattered for the purpose of enjoying a live show, since witch house, like most experimental genres, isn't really about knowing every word to every song. 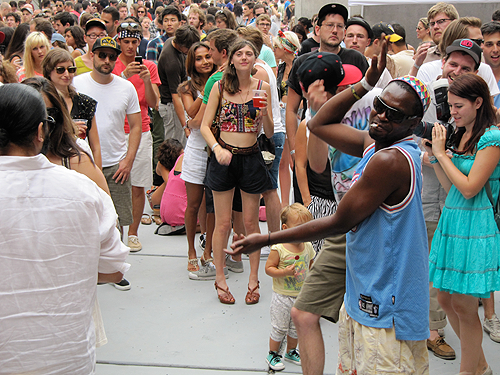 It's more about something more experiential and centered around the particular moment, and oOoOO's set enabled some of the crowd to dance while others just absorbed what was going on. The live singing was a neat addition, since I had only expected a DJ set, and the visuals and smoke machines also lent to a cool atmospheric experience. It would have been awesome to see this show at night, but I'm not complaining (except maybe about the heat, which was easily remedied by finding a shady spot and sipping a summery pink beer). One of the amazing things about this show was how flexible this type of music is in a live setting. I, for one, had neither slept nor showered for almost 36 hours at this point (a feat quite far outside the usual scope of my personal hygiene, as someone more likely to take two showers in one day than zero), and just wanted to sit somewhere and zone out and maybe nod my head a little bit. That was entirely possible, since the steps leading up to the stage served as a perfect location to sit down and watch the artists without being in anyone's way. In the meantime, there was no shortage of danceability, and many members of the crowd brought their best in that department (another reason to be pleased with my perch on the stairs, which lent a great view of not only the stage but also the audience). Clams Casino, who played right after oOoOO (with a DJ in between), continued the polysemy with a set that had even more of the crowd dancing (alcohol probably didn't hurt, either, since the dance floor was practically a performance space of its own early in the day). I recognized a lot of his set from his Instrumental Mixtape, which has been a musical favorite of mine this summer. He has produced beats for artists like Lil B and Soulja Boy, but his tracks stand up just fine on their own. 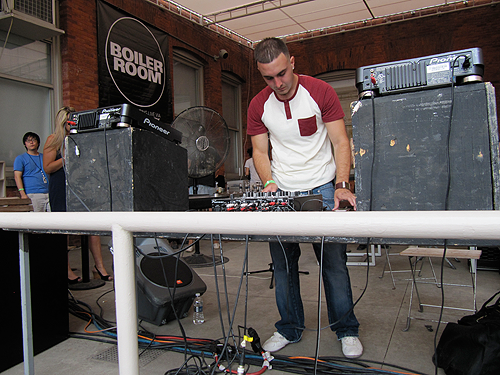 Clams Casino himself was one of the most unassuming DJs ever. I had seen him wandering around the venue early on and definitely would not have guessed that he was performing if I hadn't already had some inkling of his appearance through occasional viewing of his last.fm page. This set was quite different from oOoOO's, with the focus being on the music alone, but the vibes were good and the crowd was loving it. Sometimes, you've just got to let the beats do the talking. I'd also like to take a moment to appreciate the space where the show was held. Seeing a show at a museum already carries an air of "hip," but MoMA PS1's space was definitely one of the best places for a concert I'd been to. A lot of the time, my favorite concert spaces are those that keep it simple, with nothing but a stage and some space to stand or dance, but in this case, it was really nice to have access to so many different ways to spend time: you could sit on the stairs close to the action and listen to the music, you could dance down below, or go back a bit into the courtyard and play ping pong, sit on benches, and buy beer. You could escape from the sun's unforgiving rays by fleeing for a bit into the museum, where all of the exhibits were open. PS1 has a few more Warm Up shows planned before the end of summer, all on Saturdays during the day, and the lineups continue to be fantastic, featuring artists like Pictureplane, Grimes, Juan Maclean, and NguzuNguzu, so check them out if you plan to be in New York City for a weekend. If this post has piqued your interest in either of the artists, I'd recommend oOoOO's oOoOO EP or Clams Casino's Instrumental Mixtape. Both artists have also done very enjoyable mixes for FACT magazine, which you can probably find around the Internet although they are no longer up on the website. Clams Casino is blowing up so much this year. Mixtape this month with ASAP Rocky should only help his rise to the upper echelon of hip-hop producers.